Registration for the Spring 2019 semester begins on November 5th. If you would like to know your appointment time please log on to your portal and click MyRegistration. Registration appointment times are assigned based on the number of units completed/class level. Not sure if you are on track? Need to know what you should be registering for? Log on to your portal and click on MyDegreePath, this tool will help you determine what requirements you have not completed. Make sure to check out the “Registration Tutorial” video below regarding the steps for creating a schedule and ways to avoid registration errors! Students wanting to take courses at a community college or another institution while being concurrently enrolled at UC Merced in Fall or Spring semesters need to request permission from the Dean prior to enrolling. Before enrolling in coursework, see your Academic Advisor to determine the applicability of potential coursework to your program and to fill out the proper documents. ASSIST is an online student-transfer information system that shows how course credits earned at one public California college or university can be applied when transferred to another. Utilize this website when looking to find courses to take over summer at a community college. Note: Only lower division courses are offered at community colleges. If you need to attempt a course for a second time, please complete the Course Repeat Request form. Processing Time: Generally 2-3 business days. You will be notified via email once your request has been processed. If this will be your third (or subsequent) attempt at the particular course you were trying to repeat, you will need to fill out a "Subsequent Course Repeat" form, which can be found on the Registrar's website. If you need to attempt a course in the Natural Science for a third time (or subsequent) time you need to complete this form. If you are interested in taking a course but have not completed the prerequisite(s), you will need permission from the instructor to enroll in the course. 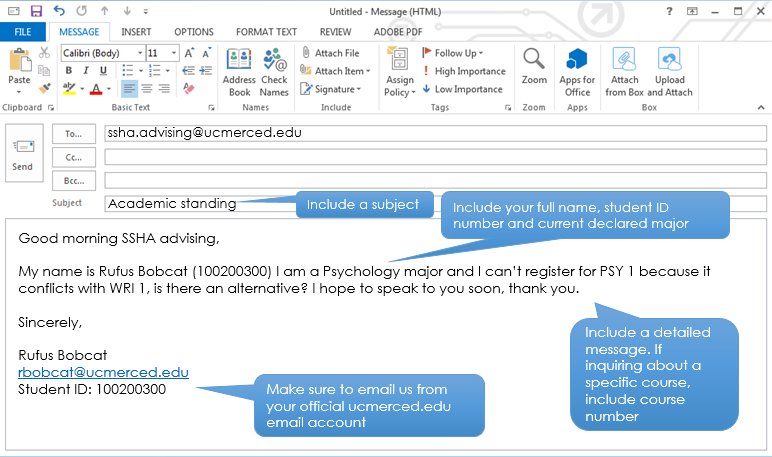 Using your UCM email, email the instructor of the course and request permission to enroll without the prerequisite; if the instructor allows you into the course forward their approval email (both your email and instructor's email should be from a UCM email account) to your assigned advisor and include your full name, student ID, current delcared major, and course name and number (ex. ECON 100).